Uttar Pradesh, the largest and the most potential State of INDIA is amongst the biggest markets for the Travel, Tourism & Hospitality Industry. The land of one of the eight wonders in the World i.e., Taj Mahal, had Uttar Pradesh being a Country, it would have been the 6th largest in the entire World and it is the most populous state in the Republic of India as well as the most populous country subdivision in the World. LUCKNOW, the capital City and KANPUR, the business capital of Uttar Pradesh with their nearby towns are amongst the largest and fastest growing consumer product markets in the country. A growing economy with tremendous increase in spending capacities and a willingness to see the world have catapulted this very market into a league of its own. Due to growth in per capita income, productivity, favorable market prices and substantial flow of credit in the City, there is sudden spurt in demand of Travel, Tourism & Hospitality products. However, due to inadequate awareness, promotion and availability, the options available for a perfect holiday destination are low compared to the other metro cities. 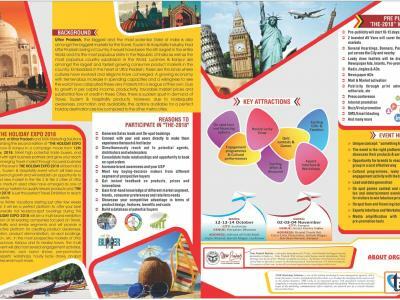 Considering these facts and the untapped opportunities in these most potential markets, U.P Tourism, Govt., of Uttar Pradesh (INDIA) along with TASK Marketing Solutions are jointly organizing the second edition of “THE HOLIDAY EXPO-2018” in Lucknow from 12th - 14th October and at Kanpur from 2nd - 4th November in a campaign mode. 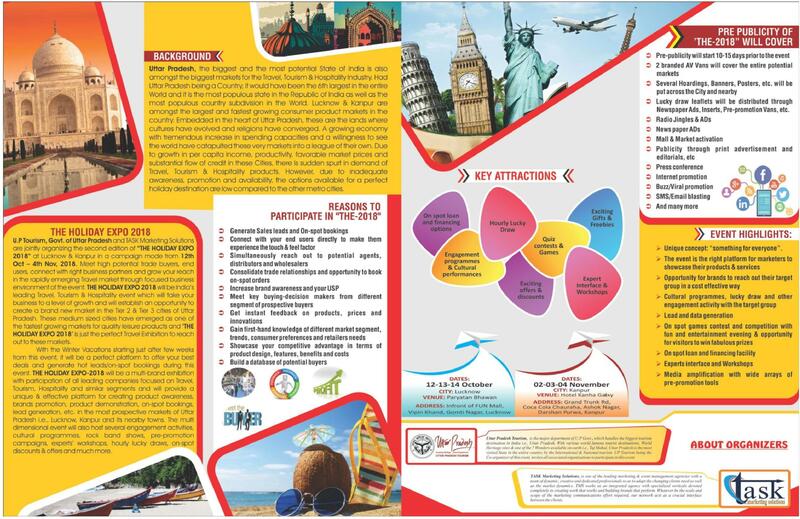 With the winter vacations starting just after few weeks from this event, it will be a perfect platform to promote the Tourism destinations across the world and attract tourists from these regions during this event.THE HOLIDAY EXPO-2018 will be a multi-brand exhibition with participation of all leading companies, State & International Tourism Boards focused on Travel, Tourism, Hospitality and similar segments and will provide a unique & effective platform for creating product awareness, brands promotion, product demonstration, on-spot bookings, lead generation, etc. in the most prospective markets of Uttar Pradesh. 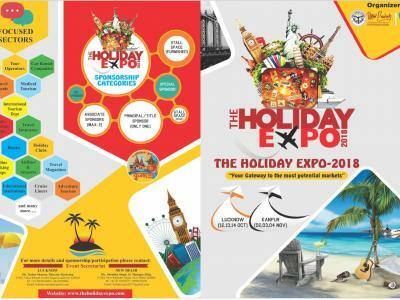 The multi dimensional event will also host several engagement activities, cultural programmes, rock band shows, pre-promotion campaign, experts’ workshops, hourly lucky draws, on-spot discounts & offers and much more. 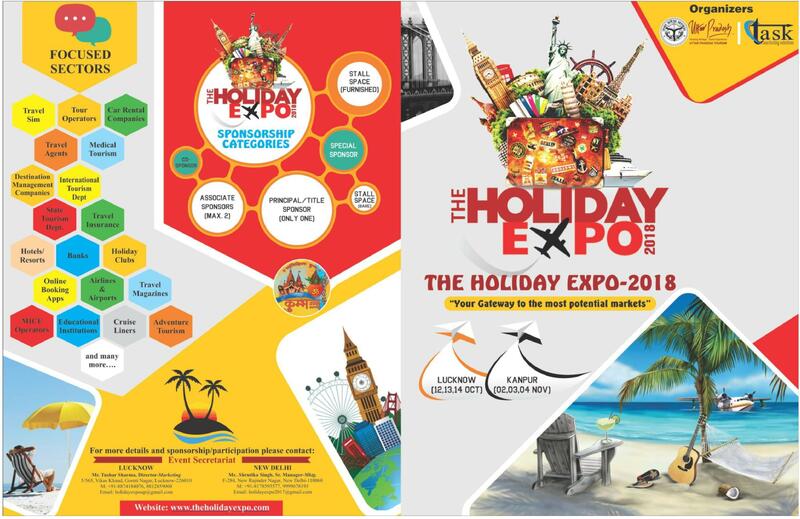 THE HOLIDAY EXPO-2018 will thus be India’s leading Travel, Tourism & Hospitality event which will take our tourism industry to a level of growth and will establish an opportunity to create a brand new market in these Tier 2 & Tier 3 Cities. We are enclosing a copy of the brochure and other supporting documents with further details for your perusal and necessary action. We shall be pleased to address any query and look forward to have your participation.